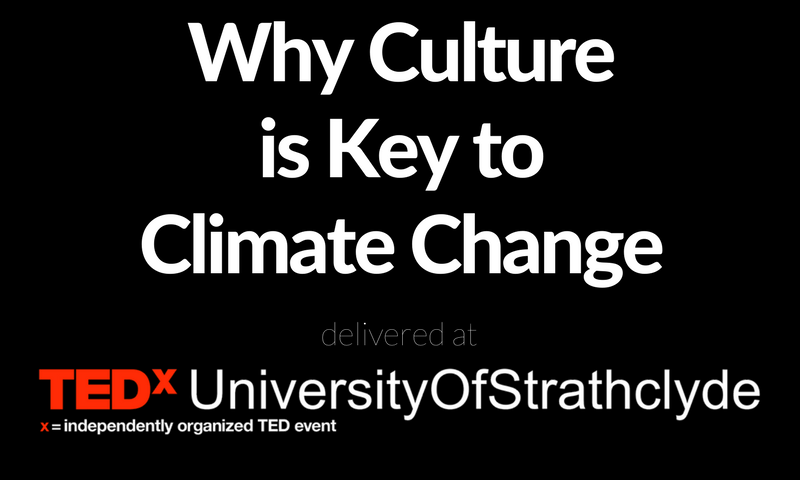 Creative Carbon Scotland's Green Arts Project Manager Catriona Patterson was invited to present a TEDx talk at the TEDxUniversityofStrathclyde on February 17 2018. We're sharing her talk below for World Poetry Day 2018, we'll share the video once it is available. This quote is from Sonnet 18 by William Shakespeare: potentially one of the most famous sonnets from one of the most famous writers in the world. Shakespeare calls upon our physical environment to woo his lover…I’d probably be convinced. However, I’m also a bit of a cynic, and I spend a lot of time thinking about climate change. In the future, ‘summer days’ might not be quite so lovely: climate change predictions for the UK range around hotter and more stifling temperatures, and much more rain. In Scotland, we’re already receiving 27% more rain than we did in the 1960s. The ‘rough winds’ of May he’s talking about? Much more likely to be all year round, and much more extreme. 2011’s ‘Hurricane Bawbag’ doesn’t quite have the same romantic, poetic flair to it, but it might be a more contemporary (and accurate) reference point for those looking to impress me nowadays. I show this to demonstrate just how ingrained are our culture and our climate, and how often the two are inextricably linked. I’m not here to convince you that climate change is real: we haven’t got time for that (not today, and actually not at all). But I am here to convince you that we can’t just consider issues of climate change to be something confined to scientists and policy makers. Since the 1950s, the speed of the changes have been unprecedented, with increased temperatures, less snow, and sea levels rising. Many aspects of climate change and associated impacts will continue for centuries, even if anthropogenic emissions of greenhouse gases are stopped tomorrow. The risks of abrupt or irreversible changes increase as the magnitude of the warming increases. Climate change is a huge physical threat to “the planet” (cute polar bears included), but mostly it’s a huge social, political and cultural threat to humans, to our society and to our way of life: our culture! Culture encompasses everything from our history, our homes, our language, our food, our architecture, our traditions: that which makes us people above all else. My concentration within this is on the arts: the visual, oral, audible manifestation of culture. Otherwise known as: TV, theatre, music, books, film, poetry. I argue this: climate change is the biggest problem we’ve got, and we need to throw everything at it. The arts are an essential part of that. I’m going to give you a whistle-stop of tour why that’s the case, what’s happening already, and why “all the world’s a stage” should be taken more seriously. The arts have always been central to how our society grows, shapes and develops, and this should, can and is extending to the biggest single issue of our time: climate change. Art can show us where we’ve come from, and where we have been: 19th century romantic landscape painting was all about the aesthetics of the sublime – creating a picture-perfect view of rolling hills and dramatic valleys: imagery which we still use to describe the UK internationally. Our societal obsession and expectation of having a white Christmas can basically be traced back to Charles Dickens writing the weather into all of his novels. Our whole cultural identity has been shaped by the words we read, write and listen to, and by the images and expressions we see reflected back to us from the walls of museums and galleries. The arts can help us understand how we got here. Art can explore the alternative realities and futures that we might face under new world conditions. Consider how George Orwell’s 20th century novel 1984 has been the warning and the prediction of the dystopian and tyrannical state which may result from surveillance and censorship. It still informs debates around data protection, net neutrality and the rights of the individual. It may be an extreme example of climate-disaster fiction (yes, it’s a genre! ), but Hollywood blockbuster The Day After Tomorrow did play out climate change impacts for the general population. We know that climate change is unlikely to happen quite that quickly, but it put climate change front and centre at the box office. The arts can help us play out what might happen under different conditions. The arts can clarify and crystallise the issues of now. Art is not merely a passive agent, serving to educate by translating concepts and science and make them more digestible. Art is an active agent of change, and we should consider, recognise and encourage this when we see it. It’s a total cliche, but I might not be here today, were it not for Al Gore’s climate change documentary ‘An Inconvenient Truth’ and the Scottish Government making it mandatory viewing in all Scottish high schools in the late 2000s. The arts can catalyse people’s lives. Jason deCaires Taylor’s ‘The Rising Tide’ combines images of the 4 horsemen of the apocalypse (borrowing from historic cultural references), with the skeletal machinery of the oil industry. The sculptures were flooded twice a day with the ebb and flow of the tide of the Thames – a rise and fall which will become ever the more extreme as sea level rise impacts the capital. There are novels, essays, short stories and poems dedicated to issues and concepts of climate: an issue where traditional scientific communication has failed, or actually turned people away from an issue that seems too difficult or too distant. Margaret Atwood’s ‘The Handmaid’s Tale’ – about a scenario in which environmental concerns have created dystopia – was written in 1985 and adapted into an award-winning TV show. Jackie Kay, the National Poet for Scotland (our Makar) had her climate change poem published in the Guardian alongside 21 others from internationally renowned poets (her poem itself paraphrased another cultural reference point, riffing off The Wizard of Oz but talking about extinction: “No lions, no tigers, no bears!”). …as figureheads in our culture. Leonardo DiCaprio: arguably one of the biggest film stars of our time, upon finally receiving an Oscar for best actor, used his speech and his wider celebrity to talk about the urgency of climate change. More people listen to bigger voices. …in our homes, through our televisions. the Prime Minister has announced a 25 year plan to eradicate all plastic waste.. But the thing is…ocean plastic is not news! We’ve known about the Great Pacific Garbage Patch since the mid-1980s, but it’s taken an emotional, artistic and accessible presentation of the impacts to prompt this change to our wider culture. Moral of the story: get ‘national treasure’ David Attenborough to say it on a Sunday night to the great British public, they will take action! These are just a tiny fraction of the countless examples of how our arts and wider culture are already taking on the mantle of climate change, but it’s still not enough. As audiences, consumers and producers of culture, we need to demand that our culture stares climate change in the face. We need to celebrate and share examples of great work. It was a book that started the whole environmental movement – Rachel Carson’s 1962 book ‘Silent Spring’ – and both Al Gore and David Attenborough have cited it as influential to their work – but when was the last you heard about a great climate change book? With the advent of social media and ‘shareability of culture’, can you imagine if people recommended climate change art as they do that which focuses on romance or war? Could good climate change art go viral? Are there recycling bins in TV mockumentary ‘The Office’? Are those electric cars they are driving in Cars 3? Is the protagonist in your crime fiction novel sipping on their black coffee from their re-useable coffee cup? When the next sci-fi film comes out showing ‘the future’, is it a realistic depiction of what life will look like 1.5 degrees warmer? We need to demand climate change be addressed more. Next time you’re watching a film – perhaps the next Avengers instalment (filmed partly in Scotland: a country with some of the most stringent climate change targets in the world), see if, among the superhero technology, the superhero stunts, and the superhero morality…you can spot the concern for a very real threat to our species. Climate change is the biggest problem we are facing as a species. Culture and the arts are what make us human: they ‘give us life’. Culture is the key to climate change. Catriona’s TEDx talk took place as part of TEDxUniversityofStrathclyde. We’ll publish the full video when it becomes available.